Ifeanyi Dike, the 23-year-old suspected ritualist and student of UNIPORT, has been re-arrested. 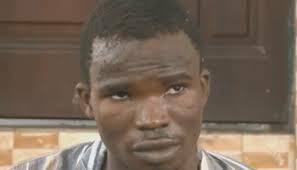 He was re-arrested in Plateau state after escaping from detention in Rivers state where he allegedly killed an eight-year-old girl. There is a reported celebration among officers of the Rivers police command Reports say the police have re-arrested Ifeanyi Dike, the 23-year-old student of the University of Port Harcourt, who killed his neighbour’s eight-year-old daughter for ritual recently. Dike was reportedly arrested in Plateau state days after he escaped from detention in Rivers state and was declared wanted by the Nigeria Police Force. He had been arrested for killing Victory Chikamso Mezu and removing her body parts for ritual. He had been paraded by the Rivers police command before he suddenly disappeared, causing massive protest and arrest of Sergeant Johnbosco Okorinize, an officer.